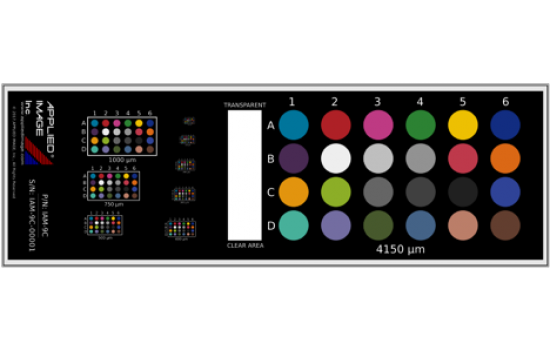 This 3" x 1" (76.2mm x 25.4mm) target includes microscopy color patches for assessing color accuracy. NIST traceable calibration data for each large color patch is supplied as spectral transmission. By using the supplied spreadsheet, this data can be converted to the color space you need (such as Adobe RGB 1998, L*A*B*, XYZ, etc.). The substrate is 0.2 mm thick polyester photo-film mounted to 0.9 to 1mm water white soda-lime glass with a 0.15mm glass coverslip for protection (exact thickness subject to change). The image, formed with photo emulsion / color dye, includes 24 unique color patches in 7 different sizes, ranging from 4.150 mm diameter to 0.150 mm diameter, and a large clear film area. Only the large patches (and clear area) are directly calibrated, but all patches are imaged and processed at the same time. Smaller patches from 1000 µm diameter to 150 µm diameter are exposed and processed at the same time to produce good correlation of the large calibrated patches to the smaller ones, but the smaller patches are not calibrated. Oil immersion objectives can be used because a standard 0.15 mm glass cover slip is permanently cemented over the color film. Each slide is individually serialized. Why are the colors reported as spectral transmission (by wavelength)? The reported data is directly based on the NIST traceable transmission and wavelength. This is the most accurate with lowest uncertainty. If we reported data in a color space such as CIE-L*A*B* or sRGB, the data becomes merged, simplified, and much less accurate. Also, the conversion from spectral transmission to color space is a one way path and not reversible. We do not know what color space the customer needs, so we leave that conversion open to them. The supplied Spectral Data is traceable to NIST for wavelength and optical transmission. Calibration of each microscope slide is done by condenser/focused beam illumination, 340-830nm, with data reported every 5nm. Typical T (transmission), k=2 uncertainty values are: 0.75%T worst case for the wavelength and %T ranges measured. See supplied calibration documents for exact uncertainties.